In the grip of the worst drought in a century, the farming community of Kiewarra is facing life and death choices daily when three members of a local family are found brutally slain. Federal Police investigator Aaron Falk reluctantly returns to his hometown for the funeral of his childhood friend, loath to face the townsfolk who turned their backs on him twenty years earlier. But as questions mount, Falk is forced to probe deeper into the deaths of the Hadler family. Because Falk and Luke Hadler shared a secret. A secret Falk thought was long buried. 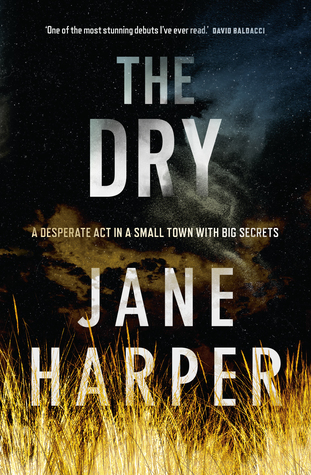 A secret Luke’s death now threatens to bring to the surface in this small Australian town, as old wounds in bleed into new ones. This author has not won me over. It has won about 96% of the people who have read this book – according to Goodreads’ rating system – but I struggled so much with it, until I decided to let it go altogether. In the beginning I didn’t have to force myself to read it at all. It was actually very enjoyable and intriguing. I mean, small towns fascinate me – and I believe I’ve said that before. I’ve never lived in a small town by definition, and any time I read about something that I find unfamiliar but curious, naturally, my interest is piqued. An entire family dies – save for a little baby – and the father is believed to have committed the atrocious murders. Who else could have done that? But why would that man kill himself right after? Everyone wants answers. Everyone except Aaron Falk. He does not want to investigate. But unfortunately for him, he has little choice. It was interesting in the beginning because I was as perplexed as the rest of the small town population. Like them, I couldn’t believe that family was murdered, especially during a time where it seemed people should have had each others’ backs instead of backstabbing one another. But when Aaron Falk’s past started to come up in conversations more and more, I became annoyed. I like a smart mystery that someone solves with their wits and creative mind, not one that is forced upon someone who wants nothing to do with it and then turns out to be highly personal. The more the story progressed, the more I realized Aaron Falk had no personality whatsoever and there was literally no one in the town with whom I could connect. And honestly, in hindsight, I feel like I didn’t deserve to enjoy this book anyway because a few days before receiving it, I saw and casually read a negative review about it and thought to myself, ‘‘Surely it can’t be THAT bad…,’’ thus instinctively disregarding the opinions of the reviewer. Perhaps I should have taken those opinions seriously after all. Sorry that this one was a bust! I hope your next book is better.